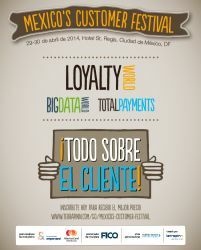 Make sense of the emerging payment market, and join over 200 senior executives from the region's biggest brands at Mexico's Customer Festival, featuring Total Payments Mexico. Learn how these innovative brands have identified new payments strategies and technologies that will boost their organization’s revenue and reduce costs. It's 2 days packed with best practice, great networking, and in depth case studies. This is your chance to meet marketing decision-makers from Mexico's biggest brands.